For other uses, see Andria (disambiguation). Andria (Italian pronunciation: [ˈandrja] ( listen)) is a city and comune in Apulia (southern Italy). It is an agricultural and service center, producing wine, olives and almonds. It is the fourth-largest municipality in the Apulia region (behind Bari, Taranto, and Foggia) and the largest municipality of the Province of Barletta-Andria-Trani. It is known for the 13th-century Castel del Monte. The city is located in the area of the Murgia and lies at a distance of 10 km (6.21 mi) from Barletta and the Adriatic coast. 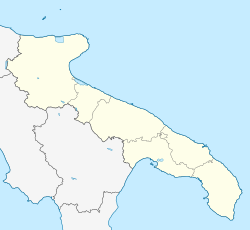 Its municipality, the 16th per area in Italy, borders with Barletta, Canosa di Puglia, Corato, Minervino Murge, Ruvo di Puglia, Spinazzola and Trani. Different theories exist about the origins of Andria. In 915 it is mentioned as a "casale" ("hamlet") depending from Trani; it acquired the status of city around 1046, when the Norman count Peter enlarged and fortified the settlements in the area (including also Barletta, Corato and Bisceglie). In the 14th century, under the Angevins, Andria became seat of a Duchy. In 1350 it was besieged by German and Lombard mercenaries of the Hungarian army, and in 1370 by the troops of Queen Joan I of Naples. In 1431 the ruler of Andria Francesco II Del Balzo found the mortal remains of Saint Richard of Andria, the current patron saint, and instituted the Fair of Andria (23–30 April). In 1487 the city was acquired by the Aragonese, the Duchy passing to the future King Frederick IV of Naples. Later (1552), it was sold by the Spanish to Fabrizio Carafa, for the sum of 100,000 ducats. The Carafas ruled the city until 1799, when the French troops captured it after a long siege. After the Bourbon restoration, Andria was a protagonist of the Risorgimento and, after the unification of Italy, the brigandage era. The 13th-century church of Sant'Agostino. Andria was a favorite residence of Emperor Frederick II, who built the imposing 13th-century Castel del Monte about 15 km south of the city center; it is one of the most famous Italian castles, and was listed as a UNESCO World Heritage Site in 1996. San Domenico (14th century, largely renovated in the following centuries). Church contains a bust of Duke Francesco II Del Balzo attributed to Francesco Laurana, and a 16th-century wooden sculpture of the Madonna with Child. Sant'Agostino, church built in the 13th century by the Teutonic Knights, who originally dedicated it to one of their patrons, Saint Leonard. The church was later handed over to the Benedictines, and rebuilt by the Augustinians after the sieges of 1350. The main points of interests are the Gothic-style gates, with precious reliefs and crests of the Del Balzo and Anjou families, as well as the Teutonic eagles. Santa Maria dei Miracoli (16th century), Sanctuary basilica 2 kilometres (1 mile) from Andria, housing a venerated Byzantine icon from the 9th-10th centuries. The basilica is on three different levels. The lower, and most ancient, comprises a hall with a nave and two aisles, with decoration showing stories from Genesis. The middle level (Tempietto) has three arcades in polychrome marbles, and is home to the Byzantine icon. The upper level, the 18th century basilica designed by Cosimo Fanzago, is preceded by another church, dedicated to the Holy Crucifix and decorated with frescoes depicting the Passion of Christ. The church of the Holy Cross (9th century). It has a nave and two aisles, separated by four pilasters. The crypt was dug in a tuff rock and includes some natural grottoes. The church of Santa Maria di Porta Santa (13th century). Andria is connected by the A14 National Motorway, and the SP 231 provincial road connecting it to Bari and Foggia. Andria has a railway station in the Bari–Barletta railway, part of the Ferrovie del Nord Barese network managed by Ferrotramviaria. The nearest Trenitalia-FS (Italian national railroads) station is that of Barletta, 10 kilometres (6 miles) from Andria. On 12 July 2016, a head-on collision between two passenger trains occurred on the line south of Andria. At least 23 people were killed and dozens more injured. The nearest airport is that of Bari, 45 kilometres (28 miles) away. The most popular sport in town is football and the main team is Fidelis Andria. Its home stadium is Stadio Degli Ulivi. ^ "Adesso è ufficiale: Andria è la sede legale della sesta provincia". AndriaLive.it. 2010-05-21. Retrieved 2013-03-25. ^ Centre, UNESCO World Heritage. "Castel del Monte". whc.UNESCO.org. Retrieved 25 December 2017. ^ "Italy train crash: 'Twelve killed' near Bari". BBC News Online. Retrieved 12 July 2016. Wikimedia Commons has media related to Andria.